The pore-forming toxin listeriolysin O (LLO) is a major virulence factor secreted by the facultative intracellular pathogen Listeria monocytogenes. This toxin facilitates L. monocytogenes intracellular survival in macrophages and diverse nonphagocytic cells by disrupting the internalization vesicle, releasing the bacterium into its replicative niche, the cytosol. Neutrophils are innate immune cells that play an important role in the control of infections, yet it was unknown if LLO could confer a survival advantage to L. monocytogenes in neutrophils. We report that LLO can enhance the phagocytic efficiency of human neutrophils and is unable to protect L. monocytogenes from intracellular killing. To explain the absence of L. monocytogenes survival in neutrophils, we hypothesized that neutrophil degranulation leads to the release of LLO-neutralizing molecules in the forming phagosome. In support of this, L. monocytogenes is a potent inducer of neutrophil degranulation, since its virulence factors, such as LLO, facilitate granule exocytosis. Within the first few minutes of interaction with L. monocytogenes, granules can fuse with the plasma membrane at the bacterial interaction site before closure of the phagosome. Furthermore, granule products directly degrade LLO, irreversibly inhibiting its activity. The matrix metalloproteinase-8, stored in secondary granules, was identified as an endoprotease that degrades LLO, and blocking neutrophil proteases increased L. monocytogenes intracellular survival. In conclusion, we propose that LLO degradation by matrix metalloproteinase-8 during phagocytosis protects neutrophil membranes from perforation and contributes to maintaining L. monocytogenes in a bactericidal phagosome from which it cannot escape. Listeria monocytogenes is a Gram-positive bacterial pathogen responsible for the foodborne disease listeriosis (1). Clinical manifestations of listeriosis range from mild and self-resolving gastroenteritis in healthy adults to life-threatening septicemia, meningitis, and encephalitis in elderly and immunocompromised individuals. In pregnant women, L. monocytogenes can cross the placental barrier and infect the fetus, causing miscarriage, stillbirth, and severe infections of the newborn (2). With a mortality rate of 20–30% despite treatment, listeriosis is an important public health concern worldwide. The L. monocytogenes intracellular life cycle in a wide variety of host cells is essential for pathogenesis (1, 3, 4). Following its internalization into a host cell, L. monocytogenes escapes from the primary internalization vesicle within 15–30 min to reside in the cytosol, where it proliferates (5, 6). Cytosolic bacteria undergo F-actin–based motility to form extracellular protrusions that are internalized by adjacent cells (7). The bacterium is then entrapped in a secondary vesicle made of two membranes, which are disrupted by the bacterium to repeat the intracellular life cycle (8). Disruption of the primary and secondary vesicles is critical for intracellular survival of L. monocytogenes and requires secretion of the pore-forming toxin listeriolysin O (LLO) (6, 9). Indeed, LLO-deficient L. monocytogenes strains remain trapped in the endocytic vesicle, are unable to divide intracellularly, and are nonvirulent in vivo (6, 10). LLO mediates intracellular survival of L. monocytogenes in primary cells and immortalized cell lines from various animal species (1, 11–13). However, activated macrophages display increased resistance to infection by L. monocytogenes (14). Neutrophils have been shown to play an important role in the control of L. monocytogenes infection in vivo (15, 16). In vitro, human neutrophils kill a large portion of L. monocytogenes via both oxidative-dependent and -independent processes (17–21). However, it was unclear if LLO could affect the biology of neutrophils during infection and confer any survival advantage to L. monocytogenes. For example, a recent manuscript argued that L. monocytogenes could resist killing by neutrophils (22). The objective of the current study was to ascertain the role of LLO in the interplay between L. monocytogenes and neutrophils. LLO was the first identified virulence factor of L. monocytogenes (10, 23, 24) and is a member of the largest family of bacterial pore-forming toxins, the cholesterol-dependent cytolysins (CDCs) (25, 26). Similar to most CDCs, LLO is secreted as a water-soluble monomer that binds to cholesterol in host membranes and oligomerizes into large prepore complexes (30–50 subunits), which then rearrange to form transmembrane β barrel channels of ∼50 nm diameter (26, 27). The mechanisms by which LLO pores halt phagosome maturation and facilitate its disruption remain incompletely understood. It is proposed that perturbation of phagosomal ionic concentrations (28), activation of host protein kinase C (29), and the cystic fibrosis transmembrane conductance regulator (30) are involved in regulating bacterial escape. A large body of evidence established that LLO is also a potent pore-forming toxin when it is released in the extracellular compartment before bacterial internalization (11, 31). Host cell plasma membrane perforation by extracellular LLO likely plays an important role in the bacterial intracellular life cycle. As recently shown, plasma membrane perforation by extracellular LLO is sufficient to induce L. monocytogenes internalization into some epithelial cell lines (11). Extracellular LLO also controls posttranslational modifications, mitochondrial remodeling, and histone modifications during L. monocytogenes infection of epithelial cell lines (32–34). How host cell perforation by extracellular LLO has such diverse effects on target cells is not well understood. It is known that host cells can recover from perforation by moderate concentrations of pore-forming toxins (11, 35, 36). Fluxes of ions and small molecules subsequent to perforation elicit multiple signaling pathways that control cell repair and alert the immune system to cell damage and pathogen attack (37). It is reasonable to propose that those fluxes similarly play an important role in the activities of extracellular LLO during host cell invasion (38–40). For example, an increase in intracellular Ca2+ upon neutrophil exposure to several cholesterol-dependent cytolysins was shown to activate the exocytosis of their numerous granules (41–45). In the present work, we dissected the role of LLO in L. monocytogenes phagocytosis and intracellular survival in human neutrophils. Our data establish that extracellular LLO affects neutrophil responses because this toxin is able to enhance the efficiency of L. monocytogenes phagocytosis and induce secondary and primary granule exocytosis. However, LLO fails to mediate L. monocytogenes intracellular survival in neutrophils. We propose that early degranulation leads to the release of proteases such as matrix metalloproteinase (MMP)-8 that degrades LLO, preventing further perforation of the neutrophil membranes. Human peripheral blood was obtained from healthy donors with approval from the Ohio State University Institutional Review Board. Blood was collected into heparinized and thrombin-treated Vacutainer tubes (Fisher, Pittsburgh, PA) for neutrophil and serum isolation, respectively. Donor serum (DS) was isolated at room temperature, then heat-inactivated for 30 min at 56°C, and stored at 4°C until needed. Neutrophils were isolated at room temperature (RT) by a one-step density gradient centrifugation on Polymorphprep (Axis-Shield, Oslo, Norway) (46). Residual erythrocytes were lysed by hypotonic shock then neutrophils were washed and suspended in HBSS without Ca2+ and Mg2+ (HBSS−). For all experiments with adherent neutrophils, 4.5 × 105 neutrophils/well were plated in 24-well tissue culture dishes coated with 30 μg fibronectin and preincubated in HBSS with Ca2+ and Mg2+ (HBSS+) ± 10% autologous DS for 10 min at 37°C. Suspended neutrophils (2 × 107/ml in HBSS+) were incubated with 1 μM latrunculin A (Sigma-Aldrich, St. Louis, MO) for 30 min, followed by 5 min incubation with 300 nM fMLF (Sigma-Aldrich). Neutrophils were centrifuged (21,000 × g) at 4°C for 5 min, and the supernatant containing released granule products (GP) was collected and stored at −20°C. Noninduced control supernatant (CS) was collected from neutrophils incubated for 35 min in the absence of latrunculin A and fMLF. The mean protein concentration of GP and CS were 341 ± 60 and 129 ± 48 μg/ml, respectively, as determined with a Bio-Rad DC protein assay (Bio-Rad, Hercules, CA). The RAW264.7 macrophage-like cell line (TIB-71; American Type Culture Collection, Manassas, VA) was cultured in DMEM supplemented with 100 units penicillin/streptomycin and 10% heat-inactivated FBS. Twenty-four hours before the experiment, 105 cells/well were plated in 24-well tissue culture–treated dishes coated with 30 μg fibronectin. 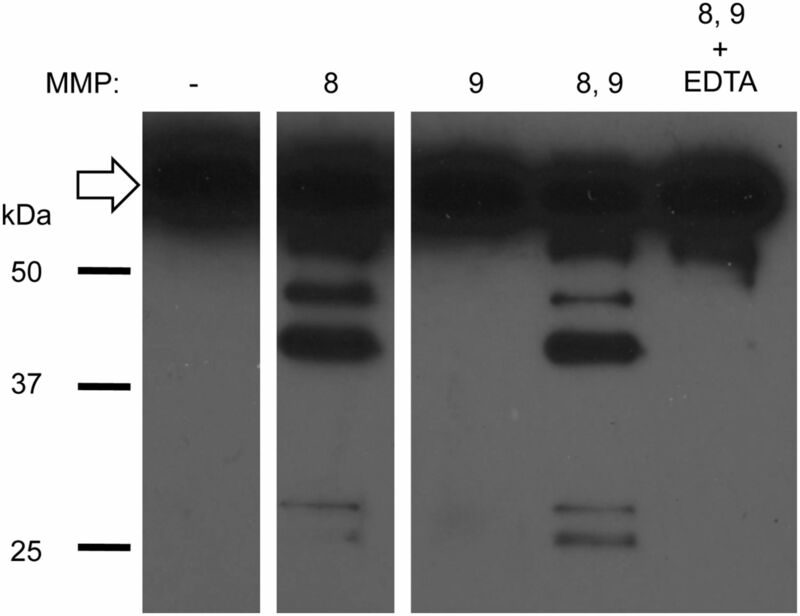 Wild-type (wt; DP10403S), isogenic LLO-deficient (Δhly, DP-L2161), and LLO-overexpressing [LLO+; DP10403S harboring the pAM401 plasmid encoding LLO that secretes 5.5 ± 1.3-fold more LLO than wt (12)] L. monocytogenes and L. innocua (ATCC 33090; American Type Culture Collection) were cultured overnight in brain heart infusion (BHI) at 37°C with shaking. The following day, bacteria were diluted 1/20 in BHI and grown at 37°C until OD at 600 nm reached 0.7–0.8. The pQE30 plasmid encoding pneumolysin (PLY) was a gift from Dr. R.K. Tweten (University of Oklahoma Health Sciences Center, Oklahoma City, OK), the pET15 plasmid encoding anthrolysin O (ALO) a gift from Dr. P.C. Hanna (University of Michigan Medical School, Ann Arbor, MI), and the pET29b plasmid encoding native LLO a gift from Dr. D.A. Portnoy (University of California, Berkeley, CA). Plasmids encoding prepore-locked LLO (LLOpL) and cysteine-free LLO (LLO C484A) were previously generated (11). Recombinant LLO, LLOpL, LLO C484A, PLY, and ALO were purified from Escherichia coli BL21(DE3) (11). The HIV transactivator of transcription (TAT)–synaptosome-associated protein-23 (SNAP-23), TAT–syntaxin-4, and TAT-GST fusion proteins were purified as described previously (47, 48). L. monocytogenes was added at multiplicity of infection (MOI) of 1 or 10 to adherent neutrophils in HBSS+ (± 10% DS), and cell culture plates were centrifuged (230 × g) at RT for 5 min. To measure bacterial association and phagocytosis, plates were incubated for 30 min at 37°C, and then cells were washed and fixed with 3.5% paraformaldehyde in PBS (pH 7.4) for 15 min at RT. To measure bacterial replication, after the initial 30 min of incubation at 37°C, cells were treated with 15 μg/ml gentamicin in 10% DS/HBSS+ for 30 min, washed, and further incubated for 4 h at 37°C in 10% DS/HBSS+ before fixation. Fixed cells were washed and incubated in blocking buffer (0.1 M glycine, 10% FBS, PBS [pH 7.4]) for 45 min at RT. Extracellular bacteria were labeled with anti–L. monocytogenes (GeneTex, Irvine, CA) and secondary Alexa Fluor–conjugated Abs (Life Technologies, Grand Island, NY). Cells were permeabilized with 0.2% Triton X-100 for 2 min, and then intracellular plus extracellular (total) bacteria were labeled using the same primary Ab and a secondary Ab conjugated to a distinct Alexa Fluor fluorochrome. After labeling, coverslips were mounted with ProLong Gold antifade containing DAPI (Life Technologies, Grand Island, NY). For analysis of labeled cells, 40 sets of fluorescence and phase-contrast images were automatically acquired for each experimental condition using the 20× or 100× objective. Neutrophils, extracellular, and total bacteria were enumerated. The percentage of intracellular bacteria was calculated as: (total bacteria − extracellular bacteria)/(total bacteria) × 100 (49). A total of 100–300 bacteria was counted in each experimental condition. L. monocytogenes was added to adherent neutrophils at a MOI of 1 and 10 in 10% DS/HBSS+ and cell culture plates were centrifuged (230 × g) for 5 min at RT. After 1.5, 3, and 5 h at 37°C, neutrophils were lysed by addition of Triton X-100 (0.2% final concentration) to enumerate the total number of viable L. monocytogenes (L. monocytogenes + polymorphonuclear neutrophils [PMNs] [Total]). To enumerate intracellular viability, 15 μg/ml gentamicin was added during the last hour of incubation, and cells were washed before the addition of Triton X-100 (L. monocytogenes + PMNs [Intra.]). As a control, L. monocytogenes were incubated without neutrophils (L. monocytogenes). Cell lysates were diluted and plated on BHI agar to enumerate CFUs. Results were expressed as fold increase in L. monocytogenes relative to the inoculum. In some assays, neutrophils were preincubated for 5 min at 37°C ± the protease inhibitor α2-macroglobulin (300 nM) before adding wt L. monocytogenes at a MOI of 10 in serum-free HBSS+, then cell culture plates were centrifuged (230 × g) for 5 min at RT. After 30 min at 37°C, the culture medium was complemented with 10% DS, and plates were incubated for an additional 1.5 h, followed by two washes and addition of gentamicin for 1 h at 37°C (total incubation time 3 h). To enumerate intracellular bacteria, cells were washed, lysed, and cell lysates were diluted and plated on BHI agar to enumerate CFUs. L. monocytogenes was added to adherent neutrophils at a MOI of 4 (nonpermeabilized cells) or a MOI of 2 (permeabilized cells) in 10% DS/HBSS+ and centrifuged (230 × g) for 1 min at RT. The MOIs were adjusted such that individual bacteria could be clearly visualized for colocalization determination. Cells were incubated for 1 min at 37°C, washed, and incubated for a total of 3, 5, 10, and 30 min at 37°C in 10% DS/HBSS+. Cells were washed, fixed in paraformaldehyde, and blocked. L. monocytogenes was fluorescently labeled as described above, and CD63 was labeled with FITC-conjugated anti-CD63 Ab (clone 46-4-5; Ancell, Bayport, MN) in permeabilized (0.2% saponin for 30 min) or nonpermeabilized cells. Images were acquired with the 100× objective. L. monocytogenes was added to adherent neutrophils at MOI of 4 and 40 in 10% DS/HBSS+ and centrifuged (230 × g) for 1 min at RT. Cells were incubated for 1 min at 37°C, washed and incubated for a total of 3, 5, 10, and 30 min at 37°C in 10% DS/HBSS+. Cells were washed, fixed, incubated in blocking solution, and labeled with FITC-conjugated anti-CD63 Ab. Fluorescence images were acquired with a 40× objective, background corrected, then cell perimeters were traced, and the mean fluorescence intensity (MFI) per cell was calculated. Data are the average of 100 cells. To measure degranulation in response to challenge with bacteria, suspended neutrophils (2 × 107/ml) were incubated in 10% DS/HBSS+ at 37°C for 10 min. Bacteria were added at a MOI of 10 and incubated at 37°C for 30 min with rotation. Neutrophils were then transferred to ice, washed, incubated with blocking solution for 30 min, and labeled with FITC-conjugated anti-CD63, anti-CD66b (clone CLB-B13.9; Accurate Chemical and Scientific Corporation, Westbury, NY), or FITC-conjugated control isotype (clone MOPC-21; Accurate Chemical and Scientific Corporation) Abs for 30 min at 4°C. To measure degranulation in response to challenge with toxins, suspended neutrophils (9 × 105/ml) were incubated with 0.5–5 nM LLO or 50 nM LLOpL at 37°C in HBSS+. After 15 min, cells were transferred to ice and labeled at 4°C as described above. Fluorescence intensities were measured with a FACSCalibur flow cytometer (BD Biosciences, San Jose, CA), and data analysis was performed with FlowJo software (Tree Star, Ashland, OR). Gating, based on forward and side scatter, was used to remove cell debris from the analysis. Average background intensity (calculated from cells labeled with the isotype control Ab) was subtracted from the MFI of CD63- or CD66b-labeled cells. Results were expressed as the corrected MFI relative to untreated cells. At least 30,000 neutrophils were analyzed for each condition in each experiment. All images, except intracellular CD63 labeling, were acquired with a motorized inverted epifluorescence microscope (Axio Observer D1; Zeiss, Thornwood, NY) equipped with 20× Plan Neofluar (numerical aperture [NA] 0.5), 40× Plan Neofluar (NA 1.3), and 100× Plan Apo (NA 1.4) objectives. The high-speed filter changer Lambda DG-4 (Xenon Arc bulb), an optical emission filter wheel Lambda 10-3 for the fluorescence imaging, and a Smart shutter that controls phase-contrast illumination were from Sutter Instrument Company (Novato, CA). The camera (back-illuminated, frame-transfer EMCCD Cascade II 512) was from Photometrics (Tucson, AZ). The microscope equipment was controlled by MetaMorph imaging software. Images of intracellular CD63 were acquired with a spinning-disk confocal microscope (UltraVIEW ERS; PerkinElmer, Waltham, MA) equipped with a 100× objective lens (NA 1.4). Fluorescence light was provided by 488-, 568-, and 647-nm argon ion lasers. The camera (cooled CCD ORCA-AG) was from Hamamatsu (Hamamatsu City, Japan). z-Slices were acquired every 0.05–0.1 μm for 60 planes. A representative set of images was deconvolved using Volocity software (PerkinElmer). The cell culture supernatants were collected, centrifuged (5 min, 230 × g, 4°C), and the lactate dehydrogenase (LDH) release assay was performed according to the manufacturer’s instructions (Sigma-Aldrich). Maximum LDH release was determined by treating cells with 1% Triton X-100 for 15 min. Percentage of LDH release was calculated as: (LDH released from LLO treated cells)/(LDH released from Triton X-100–treated cells) × 100. Erythrocytes (2.8 × 107/ml), CDCs (0.24 nM LLO, PLY, or ALO or 2.4 nM LLO C484A), GP (3–24% v/v), or CS (24% v/v) were added in a final volume of 210 μl/well in a 96-well plate on ice. When indicated, 1.2 mM EDTA or 1× protease inhibitor (PI) mixture with EDTA (PIEDTA; Roche, Indianapolis, IN) or without EDTA (PI; Roche) was added. Plates were incubated at 37°C in a PowerWavex340 spectrophotometer (Bio-Tek, Winooski, VT), and OD 700 was measured every min for 30 min. Data were shown as kinetic curves (Fig. 6B–D) or percent hemolysis at 30 min (Table II). Erythrocytes were incubated with 0.05% Triton X-100 and PBS as positive and negative controls for hemolysis. In a second set of experiments, GP (6% v/v) were preincubated with 300 nM α2-macroglobulin (Calbiochem, Billerica, MA), 2.6× PIEDTA, or 2.6× PI for 5 min at 37°C. LLO (38 nM) was added for 5 min at 37°C, then samples were diluted and erythrocytes were added at 2.8 × 107/ml (final LLO concentration of 0.24 nM). Preincubation was performed to ensure that α2-macroglobulin efficiently inhibited the proteases in the GP. Hemolysis was measured in a PowerWavex340 spectrophotometer (Bio-Tek) as described above. A total of 38 nM LLO was incubated with the indicated concentrations of GP or heat-inactivated GP (75°C for 30 min), in the presence or absence of PI cocktails (PI and PIEDTA) or 2 mM EDTA for 1 and 5 min at 37°C. The samples were boiled in reduced Laemmli buffer. Equivalent amounts of LLO were loaded in each well of a 10% SDS-PAGE gel, followed by Western blotting analysis using anti-LLO (Abcam, Cambridge, MA) and HRP-conjugated Abs (Cell Signaling Technology, Danvers, MA). In a second set of experiments, indicated concentrations of GP were preincubated with 300 nM α2-macroglobulin, PI, or PIEDTA at 37°C for 5 min. LLO (38 nM) was added, and samples were incubated for 5 min at 37°C. Preincubation was performed to ensure that α2-macroglobulin efficiently inhibited the proteases in the GP. The samples were analyzed by Western blotting as indicated above. To establish if LLO is a substrate for MMP-8 or MMP-9, LLO (38 nM) was incubated with 100 nM activated MMP-8 or MMP-9 (Calbiochem, Billerica, MA) in the presence or absence of 5 mM EDTA in 50 mM Tris-HCl (pH 7.6), 200 mM NaCl, 5 mM CaCl2, 20 μM ZnCl, and 0.05% Brij L23 (50). After 5 min incubation at 37°C, LLO was analyzed by Western blotting as described above. At least three independent experiments were performed in duplicate for each assay, unless indicated otherwise. Neutrophils, GP, and CS from at least three different donors were used. Data were expressed as mean ± SEM. The p values were calculated using a standard two-tailed t test and considered significant if <0.05: *p < 0.05 and **p < 0.01. We first determined if LLO could affect L. monocytogenes association with or phagocytosis by human neutrophils. Neutrophils were incubated with wt or LLO-deficient (Δhly) L. monocytogenes (MOI of 1 and 10) for 30 min in the presence or absence of heat-inactivated autologous DS. Cells were washed, chemically fixed, fluorescently labeled, and imaged by fluorescence microscopy (Fig. 1A). L. monocytogenes association and phagocytosis were significantly increased in the presence of serum (Fig. 1B, 1C). LLO did not affect L. monocytogenes association with neutrophils in any experimental conditions. However, LLO significantly increased the efficiency of phagocytosis at a MOI of 1 (Fig. 1C). This effect was not observed at a MOI of 10 or in the presence of serum, likely because phagocytic efficiency was already optimal under those conditions, masking the role of LLO. L. monocytogenes association with and phagocytosis by human neutrophils. Neutrophils were incubated with wt or Δhly L. monocytogenes (Lm) at MOI of 1 or 10 in HBSS+ ± 10% serum at 37°C. After 30 min, cells were washed and fixed. Extracellular bacteria were labeled with Alexa Fluor 488-conjugated Abs, total bacteria were labeled with Alexa Fluor 568–conjugated Abs, and neutrophil nuclei were labeled with DAPI. (A) Representative images of neutrophils infected with wt L. monocytogenes at MOI of 10 in HBSS+ ± 10% serum were acquired using a 20× (top and middle panels) and a 100× magnification objective (bottom panel). L. monocytogenes association with neutrophils was calculated as the total number of bacteria per neutrophil (Lm/PMN) (B), and phagocytosis was calculated as the percentage of intracellular Lm (C). Results are the mean ± SEM of at least three independent experiments, performed in duplicate. *p < 0.05, **p < 0.01. We next determined if LLO could mediate L. monocytogenes proliferation in neutrophils. Neutrophils were infected for 30 min with wt or Δhly L. monocytogenes in the presence or absence of heat-inactivated serum. Extracellular bacteria were killed by a brief treatment with the cell-impermeant antibiotic gentamicin, and cells were incubated for a total of 5 h. As presented in Table I, the total number of L. monocytogenes per neutrophil, enumerated by fluorescence microscopy, was constant over time in all conditions tested, indicating that L. monocytogenes is unable to proliferate in neutrophils, regardless of LLO expression. Such immunofluorescence analysis does not provide information about the viability of intracellular bacteria. To determine intracellular bacterial viability, wt and Δhly L. monocytogenes were incubated for up to 5 h in three distinct experimental conditions (Fig. 2). First, bacteria were incubated in cell culture medium without neutrophils (L. monocytogenes). Second, bacteria were coincubated with neutrophils (L. monocytogenes + PMNs [Total]). Third, bacteria were coincubated with neutrophils, and extracellular bacteria were killed by a 1 h treatment with gentamicin before bacterial enumeration (L. monocytogenes + PMNs [Intra.]). Results clearly established that in the presence of neutrophils, most bacteria (∼70% of the inoculum) were killed within 1.5 h (Fig. 2A, 2B). Viable bacteria were extracellular, as almost no intracellular bacteria were recovered, regardless of LLO expression. Further confirming that LLO does not confer a survival advantage to L. monocytogenes, LLO-overexpressing (LLO+) L. monocytogenes was also unable to survive intracellularly (Fig. 2C). To demonstrate the validity of our experimental conditions, we repeated this assay with a murine macrophage-like cell line (RAW264.7 cells) known to be susceptible to L. monocytogenes infection in a LLO-dependent fashion. As expected, wt, but not LLO-deficient L. monocytogenes grew intracellularly (Supplemental Fig. 1A). Indeed, wt L. monocytogenes at a MOI of 10 grew so well that after 5 h of infection, macrophages were extensively damaged (Supplemental Fig. 1B). In conclusion, LLO, which is important for L. monocytogenes replication in multiple cell types, does not protect L. monocytogenes from intracellular killing in human neutrophils. Neutrophils kill L. monocytogenes regardless of LLO expression. L. monocytogenes (Lm; wt, Δhly, and LLO+) were incubated alone (Lm) or with neutrophils (Lm + PMNs) in 10% DS/HBSS+ at 37°C at a MOI of 1 (A) and 10 (B, C). At the indicated times, Triton X-100 was added, and cell lysates were plated to enumerate CFUs. This measured the viability of L. monocytogenes in the absence (Lm) and the presence (Lm + PMNs [Total]) of neutrophils. To measure the viability of intracellular bacteria (Lm + PMNs [Intra. ]), the last hour of incubation at 37°C was carried out with gentamicin. Cells were then washed before lysis and CFU enumeration. (A–C) At least three independent experiments were performed in triplicate. Results are expressed relative to the inoculum. Statistical analyses were performed respective to CFUs enumerated in the absence of neutrophils (Lm) at each corresponding time point. *p < 0.05. Upon activation by microorganisms, several granule subsets are secreted at the neutrophil plasma membrane in a hierarchical fashion as the cytosolic Ca2+ concentration increases (51–53). Secretory vesicles are released first, successively followed by the tertiary (gelatinase), secondary (specific), and primary (azurophilic) granules. We analyzed the release of primary granules in neutrophils incubated at 37°C for up to 30 min with L. monocytogenes. L. monocytogenes and CD63, a membrane-associated primary granule marker, were fluorescently labeled in nonpermeabilized or permeabilized neutrophils to visualize granule fusion with the plasma membrane or phagosome, respectively. After 3 min and at later time points, extracellular and phagosomal L. monocytogenes colocalized with CD63, indicating that L. monocytogenes induces rapid and localized release of primary granules (Fig. 3A). Quantitative fluorescence microscopy analysis performed over the entire cell surface of nonpermeabilized neutrophils, which tends to attenuate the impact of local degranulation, confirmed that L. monocytogenes induces substantial dose-dependent degranulation at the plasma membrane (Fig. 3B). L. monocytogenes induces local degranulation of primary granules. Neutrophils were incubated with L. monocytogenes (Lm) for 1 min, washed, and incubated for a total of 3, 5, 10, and 30 min at 37°C in 10% DS/HBSS+. Cells were fixed, and Lm and CD63 were then fluorescently labeled in nonpermeabilized and permeabilized cells to distinguish granule fusion with the plasma membrane from fusion with sealed phagosomes, respectively. (A) Representative images of extracellular (two top panels) and intracellular (two bottom panels) Lm colocalizing with CD63 at 3 and 10 min. (B) MFI ± SEM of CD63 on nonpermeabilized neutrophils was measured by quantitative fluorescence microscopy. Data from a representative experiment, of two, are shown. It was previously reported that L. monocytogenes virulence factors, including LLO, potentiate neutrophil degranulation (41). We next compared the extent of neutrophil degranulation induced by L. monocytogenes and L. innocua, a noninvasive and nonpathogenic Listeria species (54). Neutrophils were incubated for 30 min with bacteria at a MOI of 10 and then labeled with anti-CD63 and anti-CD66b fluorescent Abs to report exocytosis of primary and secondary granules, respectively (Fig. 4A). L. monocytogenes was a more potent inducer of primary and secondary granule release than L. innocua. Also, recombinant LLO added exogenously to neutrophils induced dose-dependent degranulation of primary and secondary granules at the plasma membrane (Fig. 4B). This induction was pore dependent, as the LLO variant LLOpL that cannot form pores (11) was unable to induce degranulation. Such a result is consistent with the fact that LLO pores allow the influx of extracellular Ca2+ into host cells (40, 55) and that a rise in intracellular Ca2+ leads to degranulation of all granule subsets in neutrophils (56). In conclusion, L. monocytogenes virulence factors such as LLO facilitate degranulation, which can be initiated before closure of the phagosome. L. monocytogenes induces exocytosis of secondary and primary granules. (A) Neutrophils were incubated for 30 min at 37°C with L. monocytogenes or L. innocua at MOI of 10, washed, and labeled on ice with FITC-conjugated anti-CD66b, anti-CD63, or isotype control Abs. Cells were fixed postlabeling. (B) Neutrophils were incubated for 15 min at 37°C with LLO (0.5–5 nM) or LLOpL (50 nM), fixed, and labeled with FITC-conjugated anti-CD66b, anti-CD63, or isotype control Abs. (A and B) Neutrophil MFI was measured by flow cytometry. Data are expressed as MFI relative to untreated cells. Data from a representative experiment, of three, are shown. We next determined if granule exocytosis protects the neutrophil’s plasma membrane from perforation by LLO. Neutrophils were incubated with increasing concentrations of recombinant LLO for 15 min at 37°C in HBSS+. To inhibit degranulation, neutrophils were incubated in Ca2+-free medium. To quantify cell damage, cell culture supernatants were collected to measure the release of the cytosolic enzyme LDH. 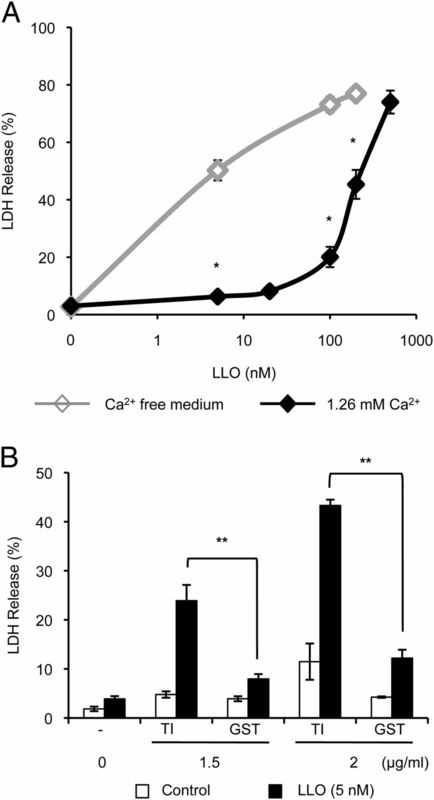 We observed that in the presence of extracellular Ca2+, neutrophils were less damaged by LLO, as 200 nM LLO was required to induce 50% LDH release (Fig. 5A), whereas, in Ca2+-free medium, only 5 nM LLO led to 50% LDH release. To further demonstrate that degranulation is required to prevent neutrophil damage, neutrophils were preincubated in HBSS+ with the TAT fusion proteins TAT–SNAP-23 and TAT–syntaxin-4 to inhibit degranulation of all granule subsets (47, 48). These fusion proteins contain the TAT cell–penetrating sequence and the N-terminal SNARE domain of SNAP-23 or the SNARE domain of syntaxin-4. As shown in Fig. 5B, treatment with 2 μg/ml of TAT–SNAP-23 and TAT–syntaxin-4 increased cell damage caused by LLO to similar levels as observed in Ca2+-free medium (43.3 ± 1.2 and 50.2 ± 3.5% LDH release, respectively), whereas treatment with 2 μg/ml of the TAT-negative control (TAT-GST) did not (12.2 ± 1.7% LDH release). This result confirms that the Ca2+-dependent protection process observed in Fig. 5A corresponds to the exocytosis of granules. Degranulation protects neutrophils from LLO-mediated perforation. (A) Neutrophils were incubated ± 5–500 nM LLO for 15 min at 37°C in HBSS ± Ca2+. Asterisks indicate a statistically significant difference between LDH release in the presence and absence of Ca2+. (B) Neutrophils were preincubated at 37°C for 10 min in HBSS+ with 0, 1.5, or 2 μg/ml TAT inhibitors (TI) consisting of equivalent concentrations of TAT–SNAP-23 and TAT–syntaxin-4 or control TAT-GST. Cells were then incubated with cell culture medium alone (Control) or 5 nM LLO in HBSS+ for 15 min at 37°C in the presence of the TAT constructs. (A and B) The release of LDH is expressed as the mean percentage of maximal LDH release ± SEM of at least three independent experiments, each performed in duplicate. *p < 0.05, **p < 0.01. We next determined if neutrophil GP could directly inhibit LLO activity. Neutrophils were treated with latrunculin A and fMLF to induce exocytosis of all granule subsets (57), and the resultant supernatant containing the GP was collected. Alternatively, CS was collected from untreated neutrophils. The addition of GP, but not CS, to the cell culture medium protected mammalian cells (RAW264.7 macrophages and erythrocytes) from perforation by LLO in a dose-dependent manner (Fig. 6A, 6B). Latrunculin A and fMLF alone did not affect LLO activity; neither did an increase in protein in the cell culture medium (Supplemental Fig. 2). We determined if GP could also protect host cells from other CDCs, such as ALO or PLY produced by Bacillus anthracis and Streptococcus pneumoniae, respectively. Similar to LLO, ALO and PLY activity was abolished by GP, but not CS (Fig. 6B–D). Collectively, these data demonstrate that neutrophil GP are protective against CDC-mediated perforation of host cells. Neutrophil GP inhibit LLO, ALO, and PLY. (A) RAW264.7 macrophages were incubated in medium alone (Control) or with 5 nM LLO ± 6–24% (v/v) GP or CS for 15 min at 37°C. Data are expressed as the mean percentage of maximal LDH release ± SEM of at least three independent experiments, each performed in duplicate. Erythrocytes were incubated with 0.24 nM LLO (B), ALO (C), or PLY (D) and GP (3–24%, v/v) or CS (24%, v/v) for 30 min at 37°C. OD 700 was measured every min for 30 min. Incubation of erythrocytes with PBS or 0.05% Triton X-100 served as negative and positive controls, respectively. (B) Results are the mean ± SEM of at least three independent experiments, performed in duplicate. (C and D) Results are from a representative experiment of two, performed in duplicate. **p < 0.01. We further analyzed the molecular basis of LLO inhibition by the GP. LLO contains a unique cysteine, located within a conserved undecapeptide sequence in the C-terminal domain, which acts as a redox switch. Once oxidized, LLO cannot form a pore complex (23); however, a cysteine-free LLO variant (LLO C484A) is still able to form pores (23, 58). As indicated in Table II, we found that GP inhibited the hemolytic activity of a cysteine-free LLO variant, indicating that an oxidative inhibition mechanism is not sufficient to account for LLO inhibition. The inhibitory role of the GP was lost after heating at 75°C for 30 min, indicating that proteins were responsible for LLO inhibition. We then tested α2-macroglobulin (a wide-range protease inhibitor that inhibits metalloproteinases), a mixture of protease inhibitors that blocks metalloproteinases, cysteine, and serine proteases (PIEDTA), and a second mixture that did not contain the metalloproteinase inhibitor EDTA, but contained identical amounts of the cysteine and serine protease inhibitors (PI). The α2-macroglobulin, PIEDTA, and EDTA alone, but not PI, prevented the anti-LLO activity of GP, suggesting the involvement of a metalloproteinase (Table II). Importantly, the protease inhibitors did not affect LLO activity (Table II). To confirm that GP proteolytically degrade LLO, we incubated LLO with increasing concentrations of GP for 1 and 5 min at 37°C and analyzed LLO proteolysis by Western blotting. LLO was degraded within 1 min, as we observed a substantial decrease in full-length LLO together with the appearance of lower m.w. LLO fragments. By 5 min, LLO was degraded to the point that it was almost undetectable (Fig. 7A). In accordance with the functional assay, GP-mediated LLO degradation was dose dependent, mediated by heat-labile component(s), and inhibited by PIEDTA, EDTA, and α2-macroglobulin, but not by PI (Fig. 7). Together, these results confirmed that a metalloproteinase is responsible for LLO degradation. Human neutrophils produce three metalloproteinases: MMP-8 (collagenase), MMP-9 (gelatinase), and MMP-25 (leukolysin or MT6-MMP). The first two are soluble and membrane-associated, whereas MMP-25 is only membrane-associated (59, 60). We determined if commercially available, purified MMP-8 and/or MMP-9 could degrade LLO. We first verified that both purified MMP-8 and MMP-9 were active and that GP displayed metalloproteinase activity (Supplemental Fig. 3). We then found that MMP-8, but not MMP-9, could degrade LLO (Fig. 8). Addition of EDTA inhibited MMP-8 activity, as expected. Furthermore, α2-macroglobulin increased intracellular survival of L. monocytogenes in neutrophils by 9.2-fold (n = 3). Collectively, these results support the hypothesis that LLO degradation by MMP-8 inhibits LLO activity in neutrophils and potentiates bacterial killing. Neutrophil GP degrade LLO. (A) LLO (38 nM) was incubated alone (0), with increasing amounts of GP (11, 44, and 88%, v/v, indicated by the wedge) or heat-inactivated GP (HI; 88%, v/v) for 1 and 5 min at 37°C. (B) LLO (38 nM) was incubated in the absence (−) or presence (+) of GP and PI cocktails that contain EDTA (PIEDTA) or not (PI) or EDTA alone for 5 min at 37°C. (C) LLO (38 nM) was incubated for 5 min at 37°C alone (−) or in the presence of GP (+) that were preincubated with α2-macroglobulin (α2-m), PIEDTA, or PI. (A–C) Samples were analyzed by Western blotting. Full-length LLO is indicated by an arrow. Shown are representative results from at least three independent experiments. MMP-8 degrades LLO. LLO (38 nM) was incubated with 100 nM MMP-8 and/or 100 nM MMP-9, in the presence or absence of 5 mM EDTA for 5 min at 37°C. Samples were analyzed by Western blotting. Full-length LLO is indicated by an arrow. Shown is a representative result of three independent experiments. 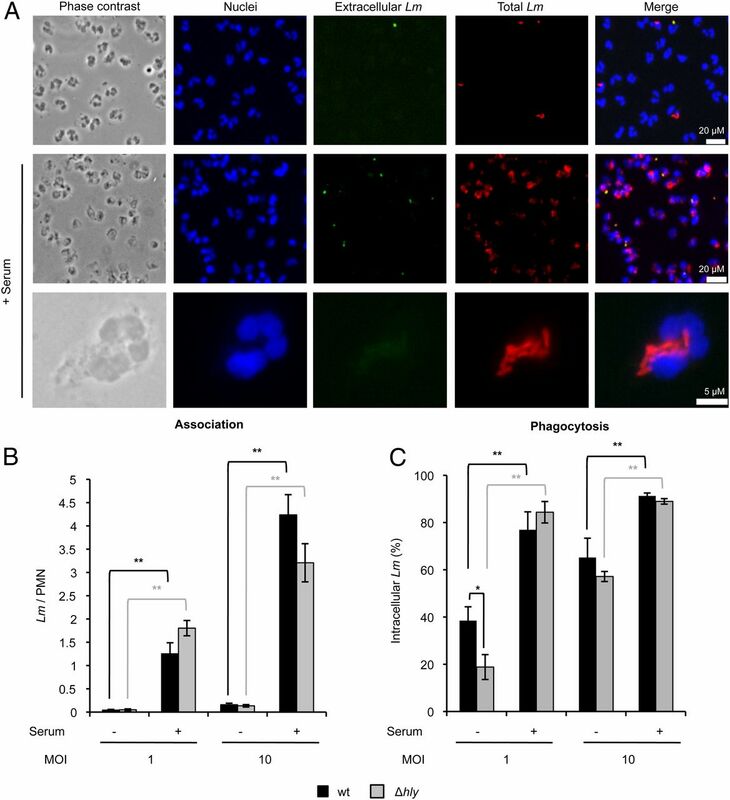 This study demonstrates that L. monocytogenes is efficiently phagocytosed and killed intracellularly by human neutrophils regardless of LLO expression. The presence of serum greatly enhances the efficiency of L. monocytogenes association with phagocytosis by neutrophils without affecting the intracellular fate of the bacteria. Rapid fusion of neutrophil granules with the forming phagosome leads to the release of proteases such as metalloproteinase-8 that degrade LLO, irreversibly inhibiting its activity. These data show that in the presence of LLO, degranulation is critical for maintaining the integrity of the neutrophil plasma membrane and suggest a mechanism for LLO inactivation in the neutrophil phagosome, thereby potentiating bacterial killing (Fig. 9). This neutrophil antitoxin response is observed with other cholesterol-dependent cytolysins, ALO and PLY, and may apply to additional families of pore-forming toxins. Model. (1) LLO monomers secreted by L. monocytogenes bind to the neutrophil plasma membrane and oligomerize into prepore complexes. (2) LLO prepore complexes undergo conformational changes to form pores, which creates an influx of Ca2+. (3) The rise in intracellular Ca2+ activates granule exocytosis at the forming phagocytic cup. Degranulation also occurs into the phagosome. Neutrophil MMP-8 rapidly degrades extracellular and intraphagosomal LLO. We propose that these actions inhibit LLO-mediated escape, trapping L. monocytogenes in a bactericidal phagosome. (4) Degranulation is linked to increased endocytosis in neutrophils. Endocytosis of LLO pores may also protect neutrophils from LLO-mediated membrane damage. Although sterilizing immunity against L. monocytogenes infection requires CD8+ and CD4+ T cell responses (61–64), several studies have concluded that innate immune cells such as neutrophils (Ly6G+ cells) and monocytes (Ly6C+ cells) are important for initial control of L. monocytogenes infection (15, 16, 65–68). Using an anti-Ly6G–depleting Ab, three studies recently assessed the role of neutrophils in mice i.v. inoculated with L. monocytogenes. Shi et al. (69) argued that neutrophils are dispensable for the control of L. monocytogenes infection, whereas Carr et al. (16) and Edelson et al. (70) showed that neutrophils are protective. Discrepancies between those studies likely result from distinct experimental approaches (61). In the former study, depleting Abs were injected at the time of infection, most likely leading to partial depletion of neutrophils during initial stages of infection. In the latter studies, depletion was likely more effective, as depleting Abs were injected at a higher dose 1 day prior to infection, and led to the conclusion that neutrophils significantly contribute to host defense. Furthermore, neutrophils are massively recruited to tissues infected with L. monocytogenes (16, 65, 71–74), and histological analyses showed that L. monocytogenes is degraded within neutrophils, but can proliferate in other cell types (75, 76). In light of those various studies, it is reasonable to conclude that neutrophils play an important role in the anti–L. monocytogenes innate defense by efficiently ingesting and killing L. monocytogenes in vivo as we observed in vitro (Figs. 1, 2, Table I). In addition to their phagocytic role, neutrophils may cooperate with other cell types to limit their infection. For example, neutrophils produce inflammatory mediators (65) and release antimicrobial molecules that can be taken up by other cells to reinforce their defense mechanisms (12, 77–79). LLO promotes L. monocytogenes intracellular survival in several cell types, but appears to exacerbate the antimicrobial responses of neutrophils. First, LLO can increase the efficiency of neutrophil phagocytosis (Fig. 1C). Although in the presence of serum, this activity is negligible. Second, LLO promotes granule exocytosis in a pore-dependent fashion (Fig. 4B), likely due to a rise in intracellular Ca2+. Indeed, intracellular Ca2+ is a central regulator of multiple signaling pathways and triggers exocytosis of lysosomes and other intracellular organelles (53, 80, 81). The rapid activation of neutrophil granule exocytosis by LLO and other L. monocytogenes virulence factors (41)(Figs. 3, 4) certainly potentiates neutrophil activation by bringing to the cell surface additional adhesion, chemotactic, and phagocytic receptors, as well as releasing antimicrobial molecules. Therefore, the rapid release of granules is expected to potentiate neutrophil responses and antagonize LLO activity in the forming phagosome, thus preventing bacterial escape (1, 28). In support of this idea, granule exocytosis protects the neutrophil’s plasma membrane from perforation by LLO (Fig. 5). This protection likely results from a direct anti-LLO activity, as our data show that neutrophil granule proteins degrade LLO and inhibit its activity (Figs. 6, 7). Furthermore, inhibition of metalloproteinases (by EDTA or the nonspecific protease inhibitor α2-macroglobulin), but not inhibition of serine and cysteine proteases, prevented LLO degradation and inactivation (Fig. 7, Table II). Neutrophil granules contain two soluble metalloproteinases, MMP-8 and MMP-9 (59, 60). Similar to our observation that MMP-8 degrades LLO (Fig. 8), lysosomal cathepsin-D was reported to degrade LLO. L. monocytogenes intracellular survival was increased in cathepsin-D–deficient cells in vitro, and cathepsin-D–deficient mice were more susceptible to L. monocytogenes infection (82, 83). Therefore, our data further support that enzymatic degradation of LLO is important for the antilisterial immune defense. Because neutrophils contain numerous antimicrobial molecules in their granules, they may use multiple strategies to antagonize the activity of LLO and kill L. monocytogenes. Of importance, it was previously shown that human neutrophil peptide 1, which belongs to the α-defensin family of antimicrobial peptides, inhibits the release and activity of LLO (12, 84). It is important to establish in future studies if defensins act in conjunction with MMP-8 to block LLO activity. These molecules may act independently of each other or may cooperate for more efficient proteolysis of the toxin depending upon the kinetics and extent of degranulation. Indeed, MMP-8 is stored in secondary granules and defensins in primary granules. Secondary granules fuse with the plasma membrane before primary granules, but are released into the phagosome after primary granules (51). We present data that support the hypothesis that degranulation protects the neutrophil plasma membrane from perforation by LLO via direct inhibition of LLO by the GP. In addition to this process, it is also possible that internalization of LLO also contributes to plasma membrane repair (Fig. 9). Indeed, it was proposed that mammalian cells internalize cholesterol-dependent cytolysins to reseal their plasma membrane (35). In support of this idea, neutrophil degranulation is associated with increased endocytosis (85, 86). Although these two protective mechanisms may coexist in neutrophils, the direct anti-LLO activity of the GP is sufficient to protect cell membranes from LLO-mediated perforation because erythrocytes, which cannot undergo internalization-mediated membrane repair, are efficiently protected from LLO by the GP (Fig. 6). We observed that neutrophil GP also inhibit ALO, produced by B. anthracis, and PLY, produced by S. pneumoniae (Fig. 6). Therefore, the neutrophil’s response to LLO likely applies to other CDCs. In accordance with this idea, neutrophils efficiently kill numerous CDC-producing bacteria (87–91). It would be of considerable interest to study neutrophil degranulation and membrane repair mechanisms in response to various families of pore-forming toxins as well as to evaluate the antitoxin activity of neutrophil GP. This is especially interesting in regards to toxins produced by pathogens known to resist killing by neutrophils, such as Staphylococcus aureus (92–94). We thank Dr. Daniel A. Portnoy (University of California, Berkeley, Berkeley, CA) for the L. monocytogenes DP10403S wt and DP-L2161 Δhly strains and the pET29b plasmid encoding native LLO, Dr. Rodney K. Tweten (University of Oklahoma Health Sciences Center, Oklahoma City, OK) for the pQE30 plasmid encoding PLY, and Dr. Philipp C. Hanna (University of Michigan Medical School, Ann Arbor, MI) for the pET15 plasmid encoding ALO. We also thank Dr. Pascale Cossart (Pasteur Institute, Paris, France) for the L. monocytogenes L028 wt and hly::Tn917 strains, Dr. Eduardo Candelario-Jalil (University of Florida, Gainsville, FL) for guidance concerning metalloproteinases, and the following individuals at The Ohio State University: Dr. J.-Q. Wu (Departments of Molecular Genetics and Molecular and Cellular Biochemistry) for use of the confocal microscope, I-Ju Lee (Dr. J.-Q. Wu’s laboratory) for assistance with confocal image acquisition and deconvolution, and Ben Foreman and Eric Weber, undergraduate students at The Ohio State University, for help with infection assays and data analysis.
. 2001. Listeria pathogenesis and molecular virulence determinants. Clin. Microbiol. Rev. 14: 584–640.
. 2013. Pathogenesis of listeriosis during pregnancy. Anim. Health Res. Rev. 14: 30–39.
. 2007. Molecular mechanisms exploited by Listeria monocytogenes during host cell invasion. Microbes Infect. 9: 1167–1175.
. 2012. Virulence factors that modulate the cell biology of Listeria infection and the host response. Adv. Immunol. 113: 19–32.
. 2006. Cytolysin-dependent delay of vacuole maturation in macrophages infected with Listeria monocytogenes. Cell. Microbiol. 8: 107–119.
. 1988. 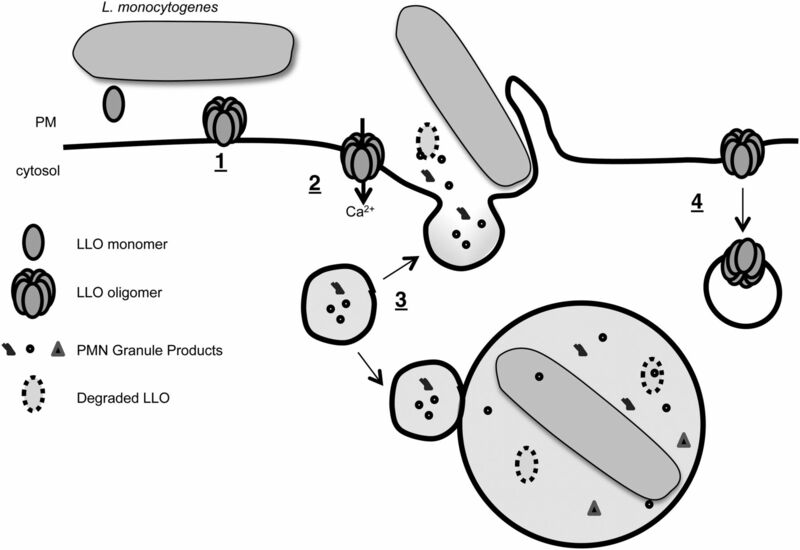 Role of hemolysin for the intracellular growth of Listeria monocytogenes. J. Exp. Med. 167: 1459–1471.
. 1989. Actin filaments and the growth, movement, and spread of the intracellular bacterial parasite, Listeria monocytogenes. J. Cell Biol. 109: 1597–1608.
. 2000. Role of listeriolysin O in cell-to-cell spread of Listeria monocytogenes. Infect. Immun. 68: 999–1003.
. 2007. Listeriolysin O: a phagosome-specific lysin. Microbes Infect. 9: 1176–1187.
. 1986. Transposon mutagenesis as a tool to study the role of hemolysin in the virulence of Listeria monocytogenes. Infect. Immun. 52: 50–55.
. 2011. The pore-forming toxin listeriolysin O mediates a novel entry pathway of L. monocytogenes into human hepatocytes. PLoS Pathog. 7: e1002356.
. 2011. Defensins enable macrophages to inhibit the intracellular proliferation of Listeria monocytogenes. Cell. Microbiol. 13: 635–651.
. 1995. Listeria monocytogenes infects human endothelial cells by two distinct mechanisms. Infect. Immun. 63: 4268–4276.
. 2007. The role of the activated macrophage in clearing Listeria monocytogenes infection. Front. Biosci. 12: 2683–2692.
. 2009. Infections in patients with aplastic anemia. Semin. Hematol. 46: 269–276.
. 2011. Specific depletion reveals a novel role for neutrophil-mediated protection in the liver during Listeria monocytogenes infection. Eur. J. Immunol. 41: 2666–2676.
. 2003. Critical role of the carboxyl terminus of proline-rich tyrosine kinase (Pyk2) in the activation of human neutrophils by tumor necrosis factor: separation of signals for the respiratory burst and degranulation. J. Exp. Med. 197: 63–75.
. 1987. Relationship of bacterial growth phase to killing of Listeria monocytogenes by oxidative agents generated by neutrophils and enzyme systems. Infect. Immun. 55: 3197–3203.
. 1985. Role of superoxide dismutase and catalase as determinants of pathogenicity of Nocardia asteroides: importance in resistance to microbicidal activities of human polymorphonuclear neutrophils. Infect. Immun. 47: 135–141.
. 1983. Human peritoneal macrophage phagocytic, killing, and chemiluminescent responses to opsonized Listeria monocytogenes. Infect. Immun. 40: 440–443.
. 1988. Comparison of four hemolysin-producing organisms (Escherichia coli, Serratia marcescens, Aeromonas hydrophila, and Listeria monocytogenes) for release of inflammatory mediators from various cells. J. Clin. Microbiol. 26: 544–551.
. 2009. Studies on the susceptibility of different culture morphotypes of Listeria monocytogenes to uptake and survival in human polymorphonuclear leukocytes. FEMS Immunol. Med. Microbiol. 57: 183–192.
. 1987. Purification, characterization, and toxicity of the sulfhydryl-activated hemolysin listeriolysin O from Listeria monocytogenes. Infect. Immun. 55: 1641–1646.
. 1941. Studies on the Listerella Group: I. Biochemical and Hemolytic Reactions. J. Bacteriol. 42: 677–687.
. 2010. The cholesterol-dependent cytolysin family of gram-positive bacterial toxins. Subcell. Biochem. 51: 551–577. 2005. Cholesterol-dependent cytolysins, a family of versatile pore-forming toxins. Infect. Immun. 73: 6199–6209.
. 2012. Packing a punch: the mechanism of pore formation by cholesterol dependent cytolysins and membrane attack complex/perforin-like proteins. Curr. Opin. Struct. Biol. 22: 342–349.
. 2006. Membrane perforations inhibit lysosome fusion by altering pH and calcium in Listeria monocytogenes vacuoles. Cell. Microbiol. 8: 781–792.
. 2002. 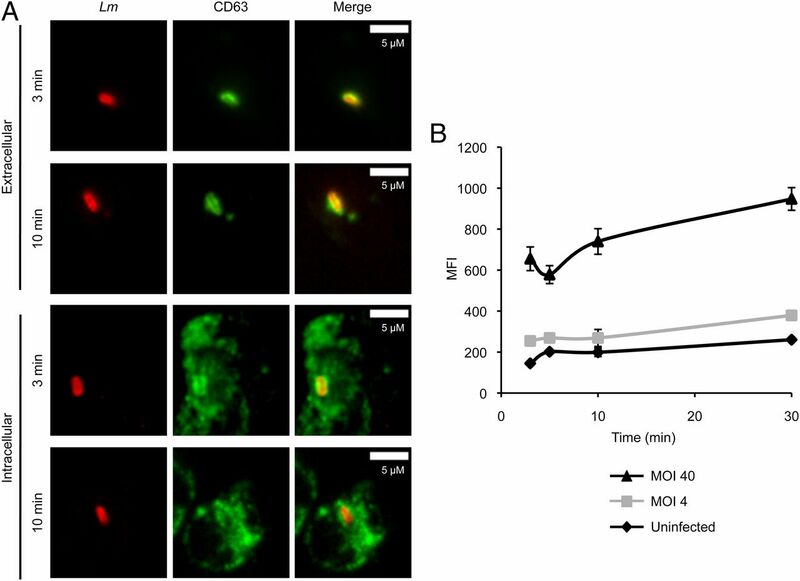 Mobilization of protein kinase C in macrophages induced by Listeria monocytogenes affects its internalization and escape from the phagosome. Infect. Immun. 70: 4650–4660.
. 2011. Listeria monocytogenes exploits cystic fibrosis transmembrane conductance regulator (CFTR) to escape the phagosome. Proc. Natl. Acad. Sci. USA 108: 1633–1638.
. 2007. Sterol and pH interdependence in the binding, oligomerization, and pore formation of Listeriolysin O. Biochemistry 46: 4425–4437.
. 2011. Listeria monocytogenes transiently alters mitochondrial dynamics during infection. Proc. Natl. Acad. Sci. USA 108: 3612–3617.
. 2007. Histone modifications induced by a family of bacterial toxins. Proc. Natl. Acad. Sci. USA 104: 13467–13472.
. 2010. Listeria monocytogenes impairs SUMOylation for efficient infection. Nature 464: 1192–1195.
. 2008. Repair of injured plasma membrane by rapid Ca2+-dependent endocytosis. J. Cell Biol. 180: 905–914.
. 2008. Two-way traffic on the road to plasma membrane repair. Trends Cell Biol. 18: 552–559.
. 2011. Pore-forming toxins induce multiple cellular responses promoting survival. Cell. Microbiol. 13: 1026–1043.
. 2011. K+ efflux is required for histone H3 dephosphorylation by Listeria monocytogenes listeriolysin O and other pore-forming toxins. Infect. Immun. 79: 2839–2846.
. 2007. The multiple mechanisms of Ca2+ signalling by listeriolysin O, the cholesterol-dependent cytolysin of Listeria monocytogenes. Cell. Microbiol. 9: 2008–2021.
. 2002. Listeriolysin of Listeria monocytogenes forms Ca2+-permeable pores leading to intracellular Ca2+ oscillations. Cell. Microbiol. 4: 483–491.
. 1999. Role of Listeria monocytogenes exotoxins listeriolysin and phosphatidylinositol-specific phospholipase C in activation of human neutrophils. Infect. Immun. 67: 1125–1130.
. 1993. Role of theta toxin, a sulfhydryl-activated cytolysin, in the pathogenesis of clostridial gas gangrene. Clin. Infect. Dis. 16(Suppl 4): S195–S199.
. 2006. Activation of human polymorphonuclear neutrophils by streptolysin O from Streptococcus pyogenes leads to the release of proinflammatory mediators. Thromb. Haemost. 95: 982–990.
. 2001. Pneumolysin potentiates production of prostaglandin E(2) and leukotriene B(4) by human neutrophils. Infect. Immun. 69: 3494–3496.
. 2001. Proinflammatory interactions of pneumolysin with human neutrophils. J. Infect. Dis. 183: 604–611.
. 2000. Neutrophil polarity and locomotion are associated with surface redistribution of leukosialin (CD43), an antiadhesive membrane molecule. Blood 95: 2462–2470.
. 2013. Exocytosis of neutrophil granule subsets and activation of prolyl isomerase 1 are required for respiratory burst priming. J. Innate. Immun. 5: 277–289.
. 2011. Granule exocytosis contributes to priming and activation of the human neutrophil respiratory burst. J. Immunol. 187: 391–400.
. 2010. Quantification of host-microbe interactions by automated fluorescence microscopy. J. Immunol. Methods 352: 186–191.
. 2013. Fluorometric immunocapture assay for the specific measurement of matrix metalloproteinase-9 activity in biological samples: application to brain and plasma from rats with ischemic stroke. Mol. Brain 6: 14.
. 2007. Neutrophil granules: a library of innate immunity proteins. Trends Immunol. 28: 340–345.
. 2010. The role of calcium in neutrophil granule-phagosome fusion. Commun. Integr. Biol. 3: 224–226.
. 2001. Comparative genomics of Listeria species. Science 294: 849–852.
. 1998. Entry of Listeria monocytogenes into neurons occurs by cell-to-cell spread: an in vitro study. Infect. Immun. 66: 4461–4468.
. 1986. Quantitative analysis of the cytosolic free calcium dependency of exocytosis from three subcellular compartments in intact human neutrophils. J. Cell Biol. 102: 2197–2204.
. 2007. The actin cytoskeleton regulates exocytosis of all neutrophil granule subsets. Am. J. Physiol. Cell Physiol. 292: C1690–C1700.
. 1990. Attenuated mutants of the intracellular bacterium Listeria monocytogenes obtained by single amino acid substitutions in listeriolysin O. Mol. Microbiol. 4: 2167–2178.
. 2012. The history of matrix metalloproteinases: milestones, myths, and misperceptions. Am. J. Physiol. Heart Circ. Physiol. 303: H919–H930.
. 2012. Specificity of binding with matrix metalloproteinases. EXS 103: 35–56.
. 2012. Early events regulating immunity and pathogenesis during Listeria monocytogenes infection. Trends Immunol. 33: 488–495.
. 1986. Listeria monocytogenes-reactive T lymphocyte clones with cytolytic activity against infected target cells. J. Exp. Med. 164: 363–368.
. 2009. Identification of an IFN-gamma-producing neutrophil early in the response to Listeria monocytogenes. J. Immunol. 182: 7069–7073.
. 1994. Administration of antigranulocyte monoclonal antibody RB6-8C5 prevents expression of acquired resistance to Listeria monocytogenes infection in previously immunized mice. Infect. Immun. 62: 5161–5163.
. 2011. Ly6G+ neutrophils are dispensable for defense against systemic Listeria monocytogenes infection. J. Immunol. 187: 5293–5298.
. 2011. CD8α(+) dendritic cells are an obligate cellular entry point for productive infection by Listeria monocytogenes. Immunity 35: 236–248.
. 1980. Resistance and susceptibility of mice to bacterial infection: histopathology of listeriosis in resistant and susceptible strains. Infect. Immun. 30: 851–861.
. 1988. Specific defects in the anti-listerial immune response in discrete regions of the murine uterus and placenta account for susceptibility to infection. J. Immunol. 140: 3947–3955.
. 1992. Choroiditis and meningitis in experimental murine infection with Listeria monocytogenes. Eur. J. Clin. Microbiol. Infect. Dis. 11: 744–747.
. 2004. Listeria monocytogenes gastroenteritis in sheep. N. Z. Vet. J. 52: 46–47.
. 1996. The inlAB locus mediates the entry of Listeria monocytogenes into hepatocytes in vivo. J. Exp. Med. 183: 359–369.
. 2009. Real-time observation of listeria monocytogenes-phagocyte interactions in living zebrafish larvae. Infect. Immun. 77: 3651–3660.
. 2002. Neutrophil-Kupffer cell interaction: a critical component of host defenses to systemic bacterial infections. J. Leukoc. Biol. 72: 239–248.
. 2002. Complementary adhesion molecules promote neutrophil-Kupffer cell interaction and the elimination of bacteria taken up by the liver. J. Immunol. 168: 308–315.
. 2006. Macrophages acquire neutrophil granules for antimicrobial activity against intracellular pathogens. J. Immunol. 177: 1864–1871.
. 2004. Calcium signalling during cell interactions with bacterial pathogens. Biol. Cell 96: 93–101.
. 2001. Plasma membrane repair is mediated by Ca(2+)-regulated exocytosis of lysosomes. Cell 106: 157–169.
. 2006. 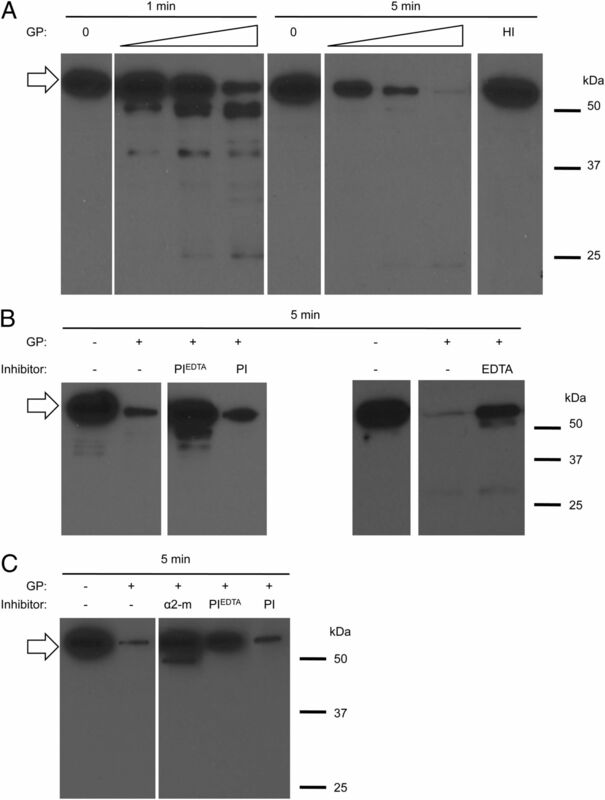 Cutting edge: a novel nonoxidative phagosomal mechanism exerted by cathepsin-D controls Listeria monocytogenes intracellular growth. J. Immunol. 176: 1321–1325.
. 2009. The innate immunity role of cathepsin-D is linked to Trp-491 and Trp-492 residues of listeriolysin O. Mol. Microbiol. 72: 668–682.
. 2009. Human alpha-defensins inhibit hemolysis mediated by cholesterol-dependent cytolysins. Infect. Immun. 77: 4028–4040.
. 1994. Linkage of azurophil granule secretion in neutrophils to chloride ion transport and endosomal transcytosis. J. Clin. Invest. 93: 247–255.
. 1986. Characterization of f-Met-Leu-Phe-stimulated fluid pinocytosis in human polymorphonuclear leukocytes by flow cytometry. Cytometry 7: 251–262.
. 2002. Interaction between human polymorphonuclear leukocytes and Streptococcus milleri group bacteria. J. Infect. Dis. 185: 85–90.
. 2013. Acquisition of the Sda1-encoding bacteriophage does not enhance virulence of the M1 Streptococcus pyogenes strain SF370. Infect. Immun. 81: 2062–2069.
. 2005. Human neutrophils kill Bacillus anthracis. PLoS Pathog. 1: e23. 1974. Bactericidal activity of aerobic and anaerobic polymorphonuclear neutrophils. Infect. Immun. 9: 337–341.
. 2009. Human neutrophils kill Streptococcus pneumoniae via serine proteases. J. Immunol. 183: 2602–2609.
. 2010. Rapid neutrophil destruction following phagocytosis of Staphylococcus aureus. J. Innate Immun. 2: 560–575.
. 2012. Neutrophils in innate host defense against Staphylococcus aureus infections. Semin. Immunopathol. 34: 237–259.
. 2013. Staphylococcus aureus LukAB cytotoxin kills human neutrophils by targeting the CD11b subunit of the integrin Mac-1. Proc. Natl. Acad. Sci. USA 110: 10794–10799.